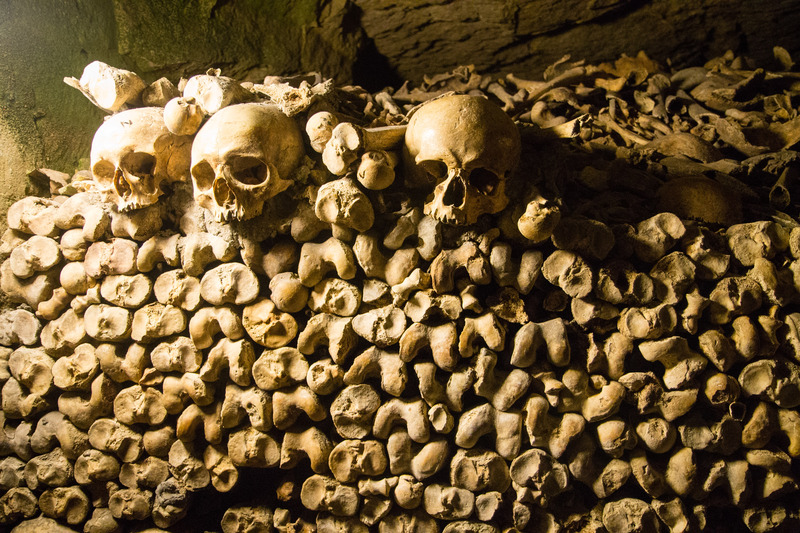 There are over 6 million people artfully scattered and stacked in tunnels beneath Paris. 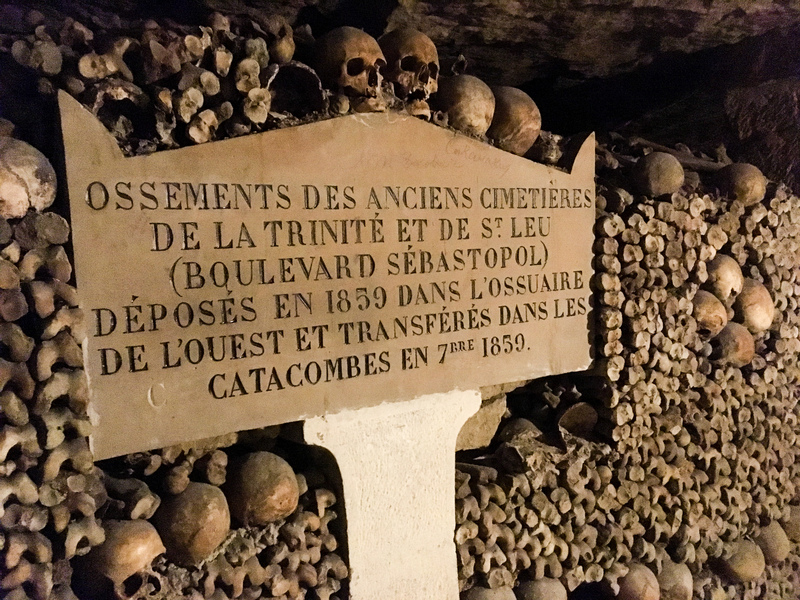 The problem of overflowing and stinking cemeteries in the late 18th century was answered with the availability of tunnels leftover from limestone mining centuries prior. Between 1786 and 1860, bones from a handful of cemeteries were relocated into these passageways, but more than that – bones were carefully arranged into decorative walls and pillars. 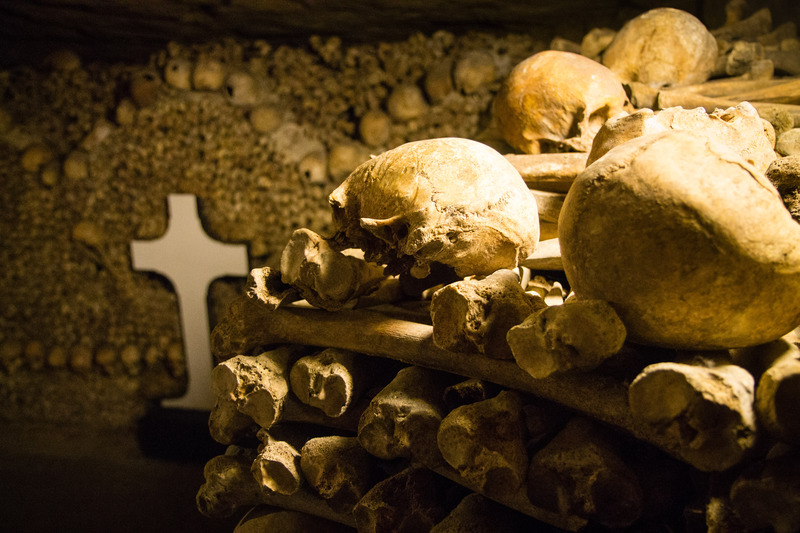 The catacombs of Paris aren’t open in their entirety to visitors, but their sheer volume is conveyed by the mile that is. 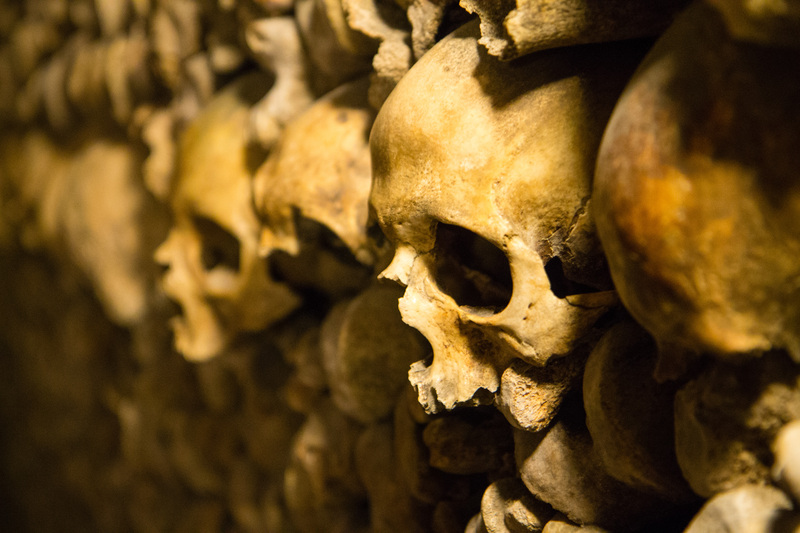 It takes about 45 minutes to wander through the ossuaries. The scale of death expands and compresses. 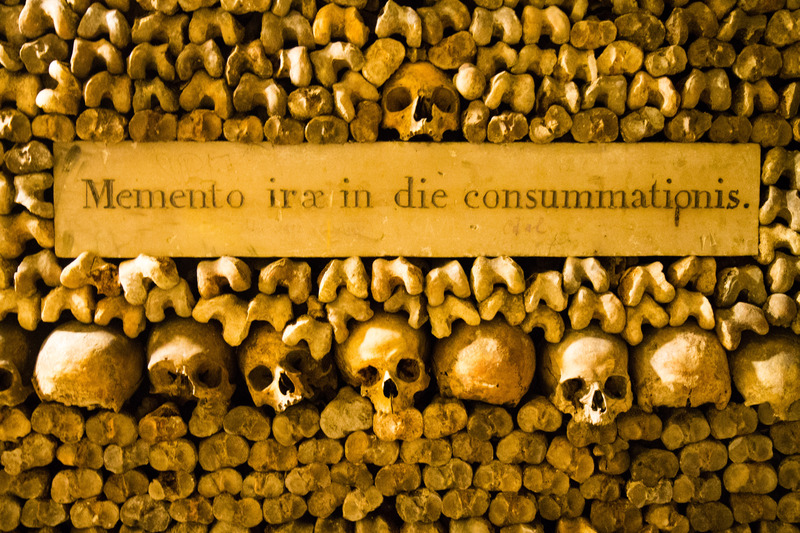 Each bone you see belonged to a person, a life in its expanse – and bones are stacked above one’s head, well over an arm’s length deep, noted because there are arm bones in the stacks, skulls interspersed carefully and artfully in the front before the organization dissolves into piles toward the back, less visible. It’s entropy made visual, I suppose. Life becomes bones becomes dust. Six million people is over a billion bones. Six million people is, perhaps, half a billion filaments of love. Six million people is more stories than that. Take your range of emotions, the number of people you care for, the depth of your own universe; multiply it by six million. That’s the Paris catacombs. By 7.4 billion – that’s the world today. By over 100 billion – that’s the number of Homo sapiens who have ever lived. For those who don’t know, I work in environmental policy. Every day I am confronted with the enormity of my work, the depth of need, the near-unstoppable momentum of societies through time. One person can make a change, but that is a rare person. Most of us will be bones in the ground or ashes in the sea and memory of us will fade away, like those of my great-great-grandparents. Perhaps an accomplishment will live on, will nudge society’s trajectory. But here I am, trying with much of my might – and I alone cannot stop climate change. Or whatever it may be. There’s the world outside, and there is the space within. Everyone is home to their own expanse, their own universe, and it’s hard – perhaps impossible in full – to completely comprehend the vastness of another’s, though they certainly exist in parallel. When you feel a total loss or an encompassing joy, the impact of that emotion is your universe. What I’m getting at is, while you perhaps cannot change the universe, you can change a universe. Each skeleton has its story, and most skeletons, I think, shaped another’s story. I am telling myself that matters, too. Beautiful and thanks for the perspective. Incredible, and incredibly creepy. Still, I’m glad you shared it!